Have you ever sat down and recalling your dog's many nicknames pictured what accent they'd have if they were human? It would certainly make it easy to commentate on their daily adventures. But would you consider going one step further and putting their escapades into a diary? One dog owner did just that, here she explains why. 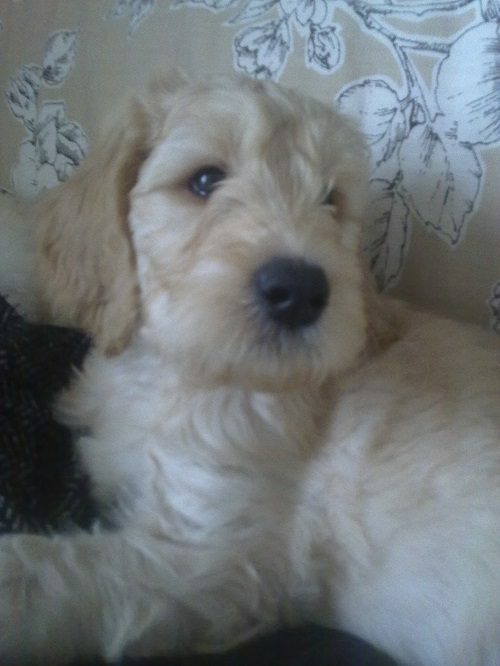 I have a Labradoodle called Dougal and when I first got him, I immediately felt he was different from dogs I’d had before; running into any house with a front door open and sitting on their sofa. Almost expecting a cup of tea, says Sarah Stephenson. His favourite day was one spent at a school fayre having his face painted by a collection of small children. He's a lover of life and adventure: a social animal, a party goer – rather more human than dog. I felt his character was begging to be put into a story. Initially I’d imagined a picture book with captions underneath. Then it struck me, I’d need to go to art classes and would life-drawing really help with dog cartoons? So I changed tack, deciding to rely on words. 'Dougal’s Diary' is a humorous, fictional story about a modern dog (Labrador/Poodle cross) dealing with the complexities of present day life and the unusual characters he encounters. When Dougal leaves the quiet of Kent for Greenwich, he has no idea what sort of dog he’ll become, no clue about London life, or whether he’s chosen his owner well and landed on his paws. Dougal documents the first 18 months of his life through the highs of Wimbledon, the Olympics, birthday parties, bonfire night, playing a sheep in a nativity play and getting into trouble with his young mate, Jacob. His diary also covers the lows of puppy classes, coping with a chaotic owner and her eccentric friends, going on a booze cruise to Calais and struggling with his own obsessions: health, balls, eating socks and Sat Nav skills. If he misbehaves what will happen to him? If he keeps his nose clean, could he star in a local play? As for his dreams of travelling on Virgin Atlantic, can they ever come true? Here is an excerpt from Dougal’s Diary where we're introduced to Dougal's boss, TD, (top dog) and Hannah, her sister. We were meeting Hannah in Barnes, not for the Boat Race – that we missed months ago. It was a blisteringly hot day and the tow path was heaving with families making the most of the weather. Next month London will be battening down the hatches, jumping into thermals and vegetating for the winter - a human habit caught from squirrels. We sped along the tow path, river to one side, trees and back gardens on the other, dodging bikes, pushchairs and runners. They did, I didn’t. ‘Dougal, mind the baby. Oh, sorry, so sorry! Dougal!’ I was high as a kite, charging through the dried leaves, my tail going like the clappers, as I sniffed dogs, chased cats and greeted every toddler going. Then, from the other side of the wall came the sounds of oars dipping in and out of the water, male voices, cries and laughter. The river was brimming with fun. I had to join in. With one Olympian leap, I was over. Bonkers Dougal! Never underestimate the consequences of your actions. The water was only twelve metres below. Did I shimmy down the walls? No way. I dropped, one furry bundle of panic in free fall, my life vanishing behind me, the Thames looming ever closer, when a ledge, barely large enough to house a seagull interrupted my descent. By some miracle I was able to grip. Thank the Lord I’d never had my nails cut. I just managed to keep my footing and look up. The two body-less heads of TD and Hannah appeared over the wall. 'Don’t move!’ they yelled in unison. My six puppy classes had had an effect. I obeyed. ‘Dougal, we’re going for help. Stay still.’ Now, Alan, my vet, may call me pea-brained, but on this occasion, some grey matter functioned. I tried dwelling on my circus heritage. Hang about, were Poodles used in high-wire acts? Dougal, just focus, you fool. Think agility, precision and balance. If one toe faltered, I’d be down that wall and carted off in the current. If dogs could sob! ‘Dougal.’ They must have heard me whimpering. ‘Be brave, Dougal. Keep calm.’ Calm! If no-one came to my aid, I’d be a goner. Suddenly three heads appeared. TD’s, Hannah’s and one belonging to a little old lady who’d arrived with a pile of old sheets and the number of the river police. ‘We’re going to tie these together and pull you up.’ Was I really expected to cling onto a sheet with my teeth? My future was not looking rosy. I imagined my funeral: park mates, grieving family. What music would they chose? Handel – no chance! Madagascar’s, “Move it, move it” - possible. “I’ll do it my way” – much more like it. Of course, I’d miss out on the pub grub. And how much would she put behind the bar? Ghosts! Were there dog ghosts? Did I possess a soul? And if so would I eject it from my body on impact of death, contact Ivana next door and have D O U G A L spelt out on her ouija-board - even return in my next life as a black cab driver and use my Sat Nav skills. I’d already done The Knowledge. Whoops, I’d almost lost my footing. My legs were dissolving to jelly. Help! Hanging on was becoming nigh impossible. The river would claim me, my corpse wash up on a bank for TD to identify. If she had me stuffed for posterity, where would I sit? I was too big for the piano. ‘Dougal! Dougal!’ They were calling my name. I was back in the real world, my heart beating at a terrifying rate, screaming for beta-blockers. I counted four heads hanging over the wall. A jogger had joined the party and was busy recruiting others. Before I fully absorbed this fact he, followed by not one but two runners, bombed over the parapet, transformed their bodies into a chain of young, male muscle and grabbed me by the collar. As quickly as it had started, my ordeal was over. My hero was then pulled to safety. He’d only risked his life for me. 'God, I need a drink!’ said Hannah. ‘We need wine,’ agreed TD. And off to a pub we went. This time I was on the lead. I now realize my existence is a blessing. Henceforth I shall treasure every moment of it. Meanwhile, I’m going to say a big thank you to my rescuer. Dougal decided to use the Metro's 'Good Deed Feed' to send his thanks by text. Thank you to the young man who pulled me back from the brink of death on the tow path in Barnes on Sunday, endangering his own life. You are my knight in shining armour. A very big lick from your furry friend, DOUGAL. SE London. If we are interviewed on National TV, I’d prefer The One Show. Should I be tempted to jump over that same section of wall, I shall remind myself, I’m not a lemming. K9 Magazine says: Wow, Dougal does like an adventure! We can imagine this book would appeal to parents of children who have a love of dogs and can share his adventures as a bed time story. Joining the Bristol School of Dancing aged seven, Sarah spent most of her childhood performing in prisons, theatres, old people’s homes and the Grand Palais in Paris. Later she trained as an actress, working with Mike Leigh and other distinguished directors. When the children arrived Sarah trained as a chef and when they’d finally flown the nest, catered in Europe, Britain and the States, giving private dinner parties. Sarah still works as a cook and writes. Dougal’s Diary is published by Crooked Cat and can be bought as an ebook from Amazon UK, Crooked Cat Books and Amazon Worldwide. These 7 Dogs Want to Know Who’ll Stop The Rain?